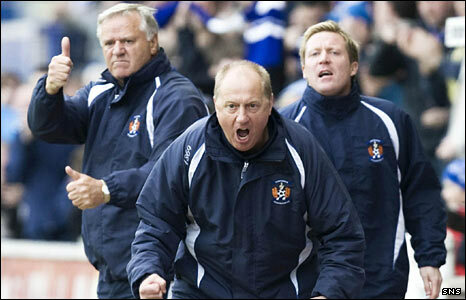 Billy Brown and Gary Locke have signed contracts with Hearts to join manager Jim Jefferies' backroom staff. The pair, who have signed deals until the summer of 2012, had been working on a week-to-week basis with the club. Assistant Brown worked with Jefferies during the latter's first spell in charge of Hearts, during which Locke, now a coach, captained the team. Brown and Locke followed Jefferies to Bradford and Kilmarnock before all three returned to Hearts this month. Midfielder Locke retired from playing at the end of last season and was set to permanently join Kilmarnock's coaching staff. However, the Ayrshire club withdrew their job offer to Locke, citing a reduction in television income as their reason. "I am absolutely delighted to be back," first-team coach Locke told the Hearts website. "It was my ambition to play for Hearts as a kid and, when I moved into coaching, it was always an ambition to be a coach at Tynecastle. It has just happened a bit quicker than I ever expected." Brown added: "I am really happy to be here and looking forward to the challenge. "I am delighted to be back at the club where we had so much success in the past and hope to bring back more success this time." Jefferies takes charge of his first home game since returning to Hearts against Falkirk on Saturday. Meanwhile, goalkeeper Marian Kello has backed Jefferies' decision not to select Jose Goncalves unless the defender signs a new contract. "I think it would be helpful for us," said Kello of the prospect of the Portuguese being in the side. "The gaffer knows what is important for the players and he needs players who want to play for him, who want to fight for him, for the club. "I don't think Jose wouldn't fight, wouldn't play as well as he can. But this is the manager's decision. "Jose has his mind open and he must know what he wants. If he wants to go, he'll go. I can't make the decision for him. "I'm not going to cry, I'm not going to laugh. That's life." Kello is on loan from FBK Kaunas until the end of the season and the keeper says talks are underway about extended his stay for another season. Jefferies also said on Friday it was "too early" to tell whether Kilmarnock striker Kevin Kyle, who is out of contract in the summer, would be joining the Edinburgh club. Meanwhile, Hearts director Sergejus Fedotovas aimed a belated parting shot at Csaba Laszlo by accusing the sacked manager of using the club as "a stepping stone" to a bigger job. Fedotovas issued a statement in which he contrasted the former manager's attitude with that of Jefferies.